Size of Male: 24-28 lbs 14.5-15.5 in. Size of Female: 24-28 lbs 13.5-14.5 in. Visit the dog names list for this breed. The Cocker Spaniel is an amiable and eager to please breed of dog. These dogs are naturally inquisitive and fairly easy to train, though housebreaking can be difficult. These dogs require moderate maintenance, but must receive daily exercise. They are at home both in the country and the city, making them excellent choices for many owners. The Cocker Spaniel derives from the English Cocker and is believed to have been bred with the toy Spaniel. The AKC made these dogs a separate breed in 1935. The popularity of this breed has now spread to Europe, where it was first recognized by the EKC in 1968 and has been steadily growing in popularity. The Cocker Spaniel is cheerful and sensitive by nature. These dogs are remarkably affectionate and are willing to please. They are also inquisitive in nature and enjoy exploring the world outside. Many of these dogs are overly submissive, and some are known to bark frequently. Living Environment – Cockers can thrive in a city or country environment. Because they are amiable and inquisitive, they do well with people as well as other dogs and pets. They tolerate temperate climates very well, though they are considered primarily indoor dogs due to their social nature. Grooming – Because of their longer hair, this breed can be a high maintenance dog in terms of grooming. They require daily brushing if their hair is allowed to stay long, as well as regular trimming. Ears and eyes must be cleaned regularly to prevent infections and tear stains. Diet & Exercise – Like all dogs, Cocker’s should eat a portion-controlled diet. These dogs require a great deal of exercise and are not well suited for homes where they cannot receive proper attention unless they are able to freely roam in the yard. Ideally, they require three walks per day, but are able to thrive in apartment buildings and other small environments with the proper level of exercise. Health – This is a fairly healthy breed, with an average life expectancy of 10-14 years. 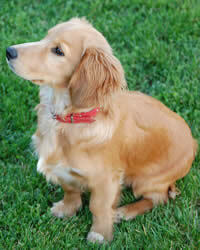 There are, however, a number of dog health problems that have been associated with this breed. They are prone to cataracts, autoimmune diseases, skin conditions, epilepsy, PRS, and HD, and the parents should have OFA and CERF certificates. The Cocker Spaniel is fairly easy to train, though housebreaking can be difficult. Crate training can be effective for puppy potty training. Obedience training is recommended, as these dogs can be quite playful. Consistent, gentle training offers excellent results.